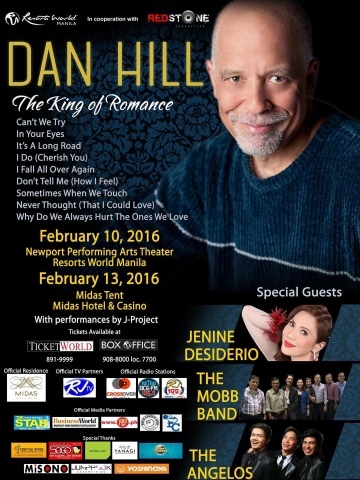 #RedStone and #TAGMedia Bring Dan Hill: "The King of Romance"
Dubbed as "The King of Romance," Dan Hill will be having his concert here in Manila to serenade his fans on a Valentines Day. Brought to us by Red Stone and Tag Media, the concerts will be on February 10, 2016 at the Newport Performing Arts Theater in Resorts World Manila and on February 13, 2016 at the Midas Tent at the Midas Hotel & Casino. Special guests are Jenine Desiderio, The Mobb Band, and The Angelos.